Observation - Goldeneye - UK and Ireland. Description: White blob behind bill is a great help in identifying this species - not to mention the golden eye. A heavily cropped distant shot. 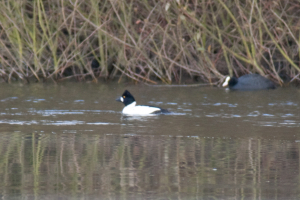 White blob behind bill is a great help in identifying this species - not to mention the golden eye. A heavily cropped distant shot.